Located in the Gold ecological Park, New Taipei City (Taipei County)'s Jinguashi, Jiufen, the Museum of Gold was opened during year 2004 as one of Taiwan’s first museum planned as an eco-museum. The aim is to combine community power and preserve the precious natural resources, mining relics, landscape, historical memories and cultural property of Jinguashi. In 2002, Jinguashi was named a potential world heritage site. As this park shows, old mining facilities can be transformed into a premier recreational tour attraction with many of the park’s original buildings being re-used as exhibition and tourist destination. The main buildings of the park includes the Museum of Gold, Environmental building displaying natural environment and geology around Jinguashi area, Gold-refining building offers opportunities for tourists to filter gold from minerals through water, Crown Prince Chalet for a glimpse of an elegant Japanese palace style building, Four Joined of Japanese –style residence for high level employees as a living house, Benshan Fifth Tunnel giving visitors a taste of what it was like to work down the mine and a Tourist information center. 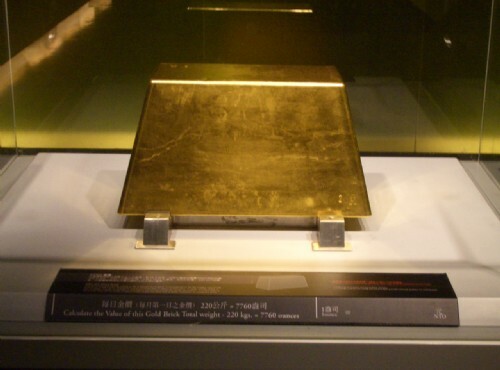 The Museum of Gold is housed in the former offices of the Taiwan Metal Mining Corp. The 1st floor displays the journey of discovering gold, Benshan Tunnels, old mining equipments, mining transport systems and a brief introduction to the WWII Japanese Allied prisoners’ camp. The 2nd floor uses gold and the main theme displaying gold characteristics, art works made of gold, and a world record, 220kg, 999 pure gold giant for visitors to see and feel. There’s even a billboard beside the giant gold piece stating “If you can lift me, carry me home!” If you come to Jiufen for your Taipei travel, don't forget to come and try your hand on the giant gold piece!